For many years, Americans have been in love with swimming pools. Cities boast public pools. YMCAs, colleges and aquatic centers offer classes and train competitive swimmers. Backyard pools, however, rank highest in people’s affections, offering fun and relaxation to the entire family. When ancient builders designed the world’s first known pool more than 5,000 years ago, they built large. The Great Bath of Mohenjo-daro (in present-day Pakistan) was approximately 39 ft. by 23 ft and almost 8 ft. deep. Swimmers or bathers walked down into the water on one of two wide staircases. It seems there have always been two types of pool people. There are those who actually want to get wet and those who choose to participate, more or less, while remaining dry. This ancient pool had a narrow brick ledge or walkway, similar to terraced decks that allowed onlookers to move from one part of the pool to another without getting wet. The walls and floor were watertight, constructed of tightly fitting bricks plastered with gypsum and natural tar. A number of rooms were located near one side of the pool, perhaps intended as dressing rooms. A nearby well may have provided the water. Modern swimmers would have felt at home in this wonderful pool, but in ancient times, scholars believe the pool was probably restricted to kings, high priests and others of high rank for ceremonial uses. Perhaps being submerged in the water symbolized purification and well-being. Whatever the intended purpose, this 5,000 year old pool was an engineering marvel, representing a tremendous cost in manpower and resources. Bathing pools were common throughout the ancient world, especially in Greece and Rome. The Romans, however, built the first pools designed for swimming about 2,000 years ago. As swimming was considered an important skill for young boys, many boys learned to stroke and kick in these early swimming pools, just as kids learn to swim today. Some of these ancient swimming pools were even heated. Until the 1800s, pools were few in number and restricted to those in the highest ranks of society. By 1837, London had six indoor swimming pools, complete with diving boards. The birth of the modern Olympic Games in 1896 spurred the popularity of swimming pools. Swimming was one of the sports included in the original Olympics in ancient Greece and was included in the 1896 Olympics. The popularity of the swimming races inspired many of those who could afford it to build pools in their local communities and at their homes. Boston was home to America’s first swimming pool, according to the book Contested Waters: A Social History of Swimming in America. The Cabot Street Bath wasn’t built for the rich and famous. It was built for the use of the people in a poor neighborhood where most people lived in homes without any type of bathing facilities. Swimming pools run the gamut from a plastic kiddy pool to the type of gorgeous, dramatic pool that deserves to have movie stars relaxing poolside. Five of America’s most beautiful and historic swimming pools deserve a mention. Americans may not have invented swimming pools, but American designers definitely took swimming pools to the next level and beyond. If you plan on a visit to Berkeley, California, plan on spending a night or two at the Berkeley City Club. This fabulous, stunning swimming pool is unlike any hotel pool you’ll ever see. It’s a fairy-tale delight to the senses with soaring arches, wonderful windows and beautiful tiles. If you want to look rather than swim, you’ll enjoy the observation deck. The Richmond Plunge, officially known as the Richmond Municipal Natatorium, was built in Richmond, California, in 1926. This huge 160 by 60 ft. pool boasts wonderful clerestory windows and tile murals. Unfortunately, the pool was literally loved to death, closing in 2001. Fortunately for Plunge lovers, the pool was restored and once again opened for happy swimmers. This exquisite pool, located on the palatial estate of William Randolph Hearst in San Simeon, California, is simply breathtaking. You can imagine a Roman emperor enjoying the ocean-view setting, marble pavilions, huge size of the pool, numerous fountains and sculptures and an ancient temple. The Roman Pool is the indoor pool at Hearst Castle. It’s a visual masterpiece with incredible tile art, alabaster lamps, marble statues and marble ladders. William Randolph Hearst’s guests, including many Hollywood stars, famous athletes and the very wealthy from around the world, enjoyed strolling around both the Neptune Pool and the Roman Pool. After World War II, the birth of interstate highways caused suburbs to spring up all across the country. From the 1950s on, millions of families abandoned city apartments for suburban living. In the city, swimming was generally restricted to crowded public pools or equally crowded lakes or beaches. For a variety of reasons, people wanted their own private pools in their own backyards. Until the 20th century, the only way to maintain a pool was to empty it and refill it. As you can imagine, the sheer cost and work involved ensured that only the very wealthy could enjoy the benefits of private swimming pools. Pool science and technology advanced, both creating and answering the demand for both public and private swimming pools. Chlorine and filtration systems made it unnecessary to continually empty and refill a pool. Chlorination made it possible to keep a pool of water safe for swimmers, for the first time in history. Today, many people prefer saltwater pools, preferring to swim without the harshness of traditional chlorinated water. 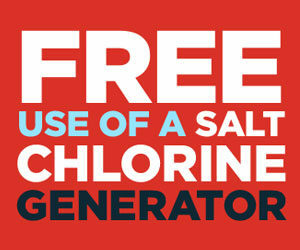 Many Pool Troopers customers enjoy free use of our Salt Water Chlorine Generator. Discover the benefits for yourself. Gunite brought the cost of pools within reach of most homeowners. Gunite pools popped up in many different shapes thanks to the flexibility of construction design. Installation was much quicker than with any previous method of pool construction, resulting in affordable pools that could fit into just about any back yard. The number of pools increased dramatically. Above ground pools further extended the number of pool owners. Kits for above ground pools were first sold in 1947. Typically, an above ground pool could be assembled and running in one day. The low cost of these entry-level pools made private swimming pools a possibility for people everywhere. 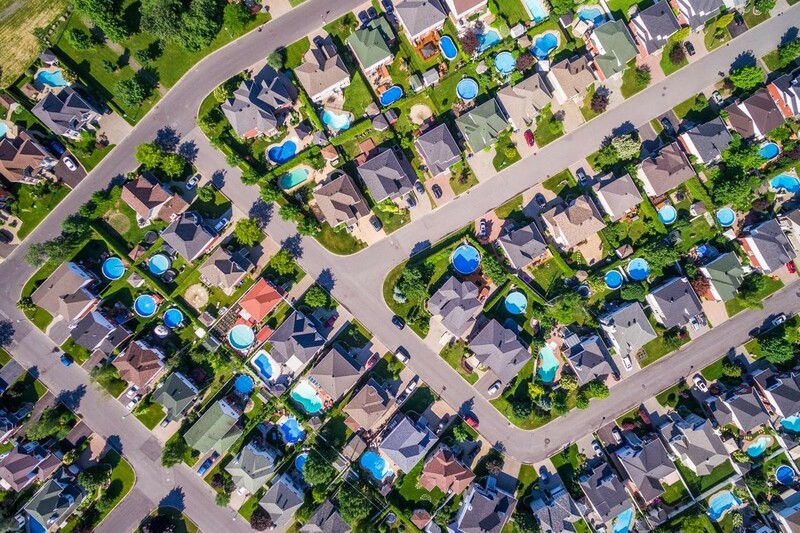 If you’ve ever flown over Florida and looked down, you undoubtedly saw countless pools. In some neighborhoods, every home has a pool. 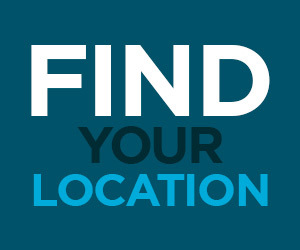 Your home may have been one of those you saw. We are sure you saw many of the pools our Pool Troopers technicians maintain, keeping the water pure and sparkling clean. 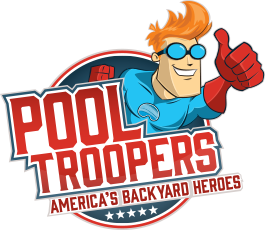 Since 1952, the Pool Troopers mission has remained the same. We believe pool owners should be able to enjoy the benefits of owning a swimming pool without all the hassle of pool chemicals and water chemistry. We believe in families, yours and ours. Our goal has always been to raise the level of professionalism in the industry. We value your time by arriving on time. We value your privacy and your home by leaving the premises secure. We deliver the services you expect to the fullest extent possible. At Pool Troopers, we offer the pool services you need at a price you can afford, whether you want us to do some or all of the work. Check out our Freedom Guarantee. There are No Contracts Ever. Why? If there’s one thing we’ve learned over the years, it’s that the only way to keep customers happy is to do the job right the first time. Have questions? Contact our Customer Service Team. Get started today.